Fracture-dislocation of the proximal humerus is typically associated with epilepsy, electrocution or extreme trauma, the so-called “Triple E” syndrome coined by Brackstone. Bilateral fracture-dislocations of the proximal humeri are usually posterior [1,2] and are rare [2-7]. We describe a rare case of a patient who suffered simultaneous bilateral anterior humeral neck fracture- dislocations during an epileptic episode. He subsequently underwent open reduction internal fixation of both fractures. A 30 year old male from mallavalli taluk, Mysore presented with severe deformity and unable to move his both upper limbs since 20 days after fall from height. He was sitting over cement well when he had a sudden onset of generalised seizure. He lost consciousness and fell on the ground. There was no external wound and associated injury in other parts of the body. He was taken to a local osteopath and massaging was done. He was later brought to our center 20 days after injury. On presentation he complained of severe bilateral shoulder pain with difficulty in movements of both the shoulders. Physical examination findings included bilateral flattening of shoulder, restricted and painful movements in all ranges of shoulder joint [Fig. 1a]. Distal neuro vascular status of both upper limbs was normal. Radiological investigation revealed comminuted fracture neck of right humerus (Neer’s 4 part fracture ) and greater tuberosity of left humerus (Neer’s 2 part fracture) with bilateral subcoracoid dislocation of shoulder [Fig. 1b]. Closed manipulations under general anaesthesia was unsuccessful in reducing the dislocations (as expected in delayed presentations). Open reduction and internal fixation on both the sides was planned. Deltopectoral approach was taken bilaterally. 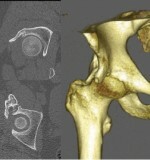 Joint capsule was divided and fracture site directly visualized. On left side the joint was relocated and the tuberosity fracture was repositioned. K wires were passed securing the tuberosity fracture and were advanced further to transfix the glenohumeral joint, maintaining reduction. On right side, reconstruction of proximal humerus fracture was done using simple plate and screws. The reconstructed proximal humerus was then relocated into the glenoid cavity and transfixed with K wires. Primary rotator cuff repair was done on both the sides. Deltoid muscle was repaired in single layer. Wound was closed in layers. Bilateral U slab immobilization was done [Fig. 3].The shoulders were kept immobilized for 3 weeks at the end of which K wires were removed and shoulder rehabilitation was started. At one year follow up the patient had acceptable range and was able to carry out daily activities. Radiographs showed good union (Fig. 3). Simultaneous bilateral anterior dislocation of the shoulder associated with bilateral fracture of the proximal humeri is quite rare and only a few cases have been reported in the literature [3-7]. The most common mechanisms producing bilateral anterior dislocation or fracture dislocation of the shoulder are violent bilateral traction and sudden muscular contractures, or bilateral deceleration forces associated with trauma. 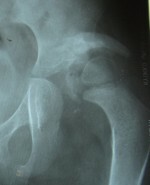 In most cases with anterior dislocation of the shoulder, the associated fracture is a 2-part fracture. The present case had one side 2-part and other side 4 part anterior fracture-dislocation and the injury was caused by a first seizure episode. Bilateral simultaneous shoulder fractures are usually the consequence of a severe trauma, as in road accidents, falls, high-energy traumas, and electroconvulsive therapy employed in the treatment of severe mental disorders . All such injuries cause the fractures by direct trauma, when the shoulders are beaten against a hard surface. The injury mechanism of anterior dislocation of the shoulder is forced extension, abduction, and external rotation. A direct blow to the posterior aspect of the shoulder or a sudden and violent contraction of muscles around the shoulder can result in anterior dislocation. Unilateral anterior dislocation of the shoulder is common because of the position naturally adopted by the upper extremity during a fall. However, bilateral occurrence is rare because in almost all instances one extremity takes the brunt of the impact . Treatment options for proximal humerus fracture dislocations in such cases requires individualised approach for each side as per the personality of the fracture. Treatment options for proximal humerus fractures include operative and non-operative methods, but non operative treatment of complex i.e., three part and four-part fractures is well known to result in malunion and stiffness of the shoulders. The greater tuberosity is displaced in the approximately 15% of all anterior dislocations. When a two part fracture dislocation is associated with a greater tuberosity fracture that is displaced, the diagnosis of rotator cuff tear is almost certain, and this can cause long term instability and functional impairment if the greater tuberosity fragment is not anatomically reduced [9-12]. Therefore we selected surgical fixation for this patient. Another issue that complicated our case was the delayed presentation. This is common in our country and many a times the first to treat is a local osteopath. Closed relocation was not possible and we had to do an open reduction, however the results at the end of one year were acceptable in spite of delay. A longer follow up with avascular necrosis in mind (specially for right side) will be needed. Bilateral simultaneous anterior fracture dislocation of the shoulder is rare. The planning has to be according to individual fractures and open reduction might be needed in delayed presentations. The early results are good even with complicated injury, rotator cuff tears and delayed presentation as seen in our case..
1. Muriel B, Stuart DP, Andrew K. Triple “E” syndrome: Bilateral locked posterior fracture dislocation of the shoulders. Neurology2001; 56: 1403-4. 3. Segal D, Yablon IG, Lynch JJ, Jones RP. Acute bilateral anterior dislocation of the shoulders. Clin Orthop Relat Res 1979; 140:21–2. 6. Dinopoulos HT, Giannoudis PV, Smith RM, Matthews SJ (1999) Bilateral anterior shoulder fracture-dislocation. A case report and a review of the literature.Int Orthop 23:128-130. 8. Neer CS. Displaced proximal humeral fractures: Classification and evaluation. J Bone Joint Surg Am 1970;52(6):1077-89. 9. Robinson CM, LAK Khan, MA Akhtar. Treatment of anterior fracture dislocations of the proximal humerus by open reductionand internal fixation. J Bone Joint Surg Br 2006; 88-B(4): 502-8. 10. Ferkel RD, Hedley AK, Eckardt JJ. Anterior fracture-dislocations of the shoulder: pitfalls in treatment. J Trauma. 1984 Apr;24(4):363-7. 11. Helmy N, Hintermann B. New Trends in the Treatment of Proximal Humerus Fractures.Clin Orthop Relat Res 2006; 442: 100-8. 12. Brunner F, Sommer C, Bahrs C, Heuwinkel R, Hafner C, Rillmann P, et al. Open Reduction and Internal Fixation of ProximalHumerus Fractures Using a Proximal Humeral Locked Plate: A Prospective Multicenter Analysis. J Orthop Trauma 2009; 23(3):163-72.